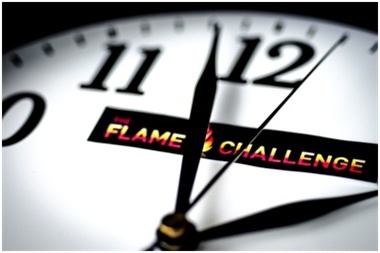 Double X Science: The 2013 Flame Challenge Question: What is time? Last year, Alan Alda presented scientists all over the globe with a challenge: explain what a flame is to an 11 year old. This was born out of his personal experience when, at age 11, he asked his teacher what a flame was and was given a one word, and completely incomprehensible answer, "oxidation." As a founding member of Stony Brook University's Center for Communicating Science, Alda is committed to promoting better science communication from scientists. In an effort to enhance the dialogue between scientists and the general public in a fun and meaningful way, Alda initiated the first ever The Flame Challenge competition. Much to everyone's surprise, this creative competition was a big hit, and over 800 entries were submitted (including mine!). Each entry was vetted for accuracy and then judged by entire classrooms of 11-year-olds located all over the world. The winner of the first Flame Challenge was a graduate student and father, Ben Ames, who presented the public with an incredible story and original music that thoroughly explained the concept of a flame. Because of the success of last year's Flame Challenge, Alda has set out to do it again. However, instead of asking the question himself, he crowdsourced the question from -- you guessed it -- actual 11-year-olds. "Last year's contest question came from a real 11-year-old: me,” Alda said. “But when I asked what a flame was at the age of 11, I was probably younger in some ways than most 11-year-olds are now. They're asking a very deep question this year. It's going to be fun to see how scientists around the world answer that one in everyday language." According to the press release, the Center for Communicating Science collected about 300 questions from children, ranging from “Does the universe have a known end?” and “How does the brain store all that information?” to “Why are Shetland ponies so small?” But, once the votes were counted, there was one question that reigned supreme: What is time? Scientists will have until March 1, 2013, to submit their answer, and this year, there will be winners selected from two categories: written and video/graphics. Once submitted, the explanations of time will be scrutinized by over 5,000 11-year-olds worldwide. The winning scientists will be rewarded with a trip to New York City and honored at a World Science Festival event on June 1, 2013. For more information on entering or judging the contest, or to see last year’s top entries, please visit www.FlameChallenge.org. If you are planning to enter, best of luck! I can't say that this is an easy question, and I look forward to seeing all the wonderful answers come spring. Happy sciencing!